Affinity Dental has proudly served the Richmond, British Columbia, area for more than 10 years. We offer a convenient location, long hours, and friendly staff to make your experience as comfortable as possible. 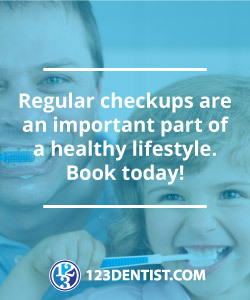 We understand the challenges of fitting proper dental care into your schedule and do everything possible to make your visits easy and pleasurable. We also understand that dental treatments can be stressful. Our staff works hard to make sure every office visit is a pleasurable experience. Our gentle approach is distinctly family friendly. We can treat every generation in your family, from children to seniors. Warm and friendly, everyone in the office strives to provide you with the best customer service possible. We have two dentists on staff. Dr. Soumya Jain completed her education in Pune, India, before returning to her childhood home of Richmond, British Columbia, to serve the community she grew up in. When she’s not working in the office, Dr. Jain volunteers her time with a nonprofit East Vancouver dental clinic. The newest addition to our staff is Dr. Ning Yuan. Dr. Yuan graduated from the Nanjing Medical University in China and pursued a Ph.D. from the University of Oslo, Norway. With 12 years of experience practicing in China and two years in Canada, Dr. Yuan brings a long, dedicated history of superior periodontal care to the practice. Dr. Yuan speaks Mandarin fluently and focuses on offering patient-centered care. Request an appointment today and experience our care and convenience first hand, or read on to for more great reasons why Affinity Dental is the best choice for your dental needs. 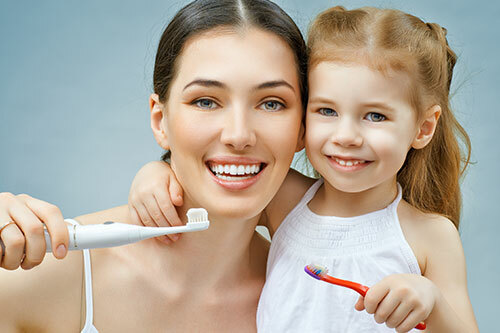 As a dedicate Family Richmond Dentist, we take an interest in getting to know you and your family in order to deliver dental care that is tailored to your needs and goals. We are open 7 days a week and are swift to get you out of pain! We will not up-sell you but rather present you with treatment options to restore or enhance your smile. The Affinity Dental team are committed to remaining the forefront of dental technology. From our relaxing decor to our warm, friendly staff to our sedation dentistry – we strive to make your experience with us enjoyable. Alongside the promises to our patients, we offer an ultra-convenient location and a set of principles that define who we are, where we’re going, and why we’re going in that direction. It can be difficult to find time to fit proper dental care into your busy schedule. That’s why we make it as easy as possible with our convenient hours and location. 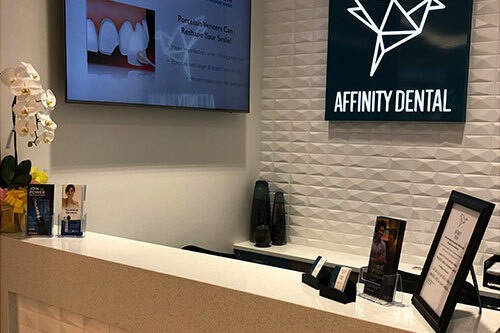 Affinity Dental is located inside the Richmond Centre mall between Purdy’s Chocolates and Shaw. We’ve set up practice right where you’re already spending your time, so stopping in for a visit is quick and easy, and there’s always plenty of free parking. We keep the same hours as the mall, so you can make your appointment anytime between 10 a.m. and 9 p.m. Monday through Thursday, and between 9 a.m. and 9 p.m. Friday and Saturday. We’re even open from 11 a.m. to 7 p.m. on Sundays. Whether you need an evening appointment, weekend booking, or daytime slot, we have something to suit your schedule, so dental care never needs to go overlooked again. We take the time to get to know our patients because we are a small clinic we maintain a genuine, honest approach to dentistry that our patients appreciate. We are thrilled when generations of patients come to us for their oral health and cosmetic dentistry needs. Our gentle approach makes Affinity Dental the ideal dentist for children and seniors. We accept all dental plans registered in British Columbia as well as most plans registered across Canada. We believe dental care should be accessible and affordable, and we strive to make this a reality for all our patients. Give us a call to learn more about how we can work with your dental coverage. Affinity Dental is equipped with state-of-the-art technology and equipment that will give you the highest level of care. We offer digital X-rays that reduce your exposure by as much as 90 percent. This digital radiography is highly efficient, giving us a clear view of your dental situation, so we can provide personalized care. By turning to digital films rather than print copies, we’re also easing our impact on the environment. Using the VELscope system, we can screen effectively for oral cancer. This blue light provides a pain-free way for our dentists to scan the mouth for any suspicious lesions. We’re committed to helping you stay on top of your dental health with systems like these that promote easy, comfortable solutions to your dental problems. Affinity Dental offers a wide range of services for both preventive and restorative dental care. We provide crowns, bridges, and mercury-free fillings to help you recover from cavities, chipped teeth, or lost teeth. Dentures are available, as well, if you’re missing more than one tooth. We provide orthodontics, including the popular Invisalign system, to help correct bite problems, crooked teeth, and gaps. Are you looking for cosmetic services to give you a brighter, more confident smile? We offer veneers that can cover minor gaps or chips and whiten the appearance of your teeth. Spa Dent whitening is another option if you’re looking to brighten your smile. If you’re nervous about any of your treatments, talk to our dentists about oral sedation. This will help to ease your anxiety, so you can enjoy a more comfortable office visit. Oral sedation may also make it possible to tackle several procedures in a single visit, so you can take care of all your dental needs at once. If you’re looking for a friendly dentist in the Richmond area, turn to Affinity Dental. You can give us a call now or make your appointment request online. We’re here for all your dental needs. At Affinity Dental we’re actively involved in our Richmond, BC community and in supporting local businesses and organizations. We’re also proactive about important issues for our neighbors, like health and sustainability. Our mission is to be a strong voice for community health and to help educate Richmond families about any and all advances in dentistry that will help them lead longer and more enjoyable lives. And we do our part for sustainability, softening our ecological footprint by choosing digital technology for diagnostic x-rays and for regular communication with our patients. We also do our very best to use biodegradable and earth-friendly products throughout the office wherever possible. We look forward to sharing our talents and energy with patients, their families, and their friends for a very long time!